In William Shakespeare's birthplace, discontent over Brexit runs even deeper than three years ago when the "scepter'd isle" shocked the world by voting to leave the European Union. The 2016 referendum revealed a United Kingdom divided over much more than EU membership. It has sparked impassioned debate about everything from secession and immigration to capitalism, empire and what it means to be British. Just days before the United Kingdom was originally supposed to leave the EU on March 29, nothing is resolved - it remains uncertain how, when or if it ever will. 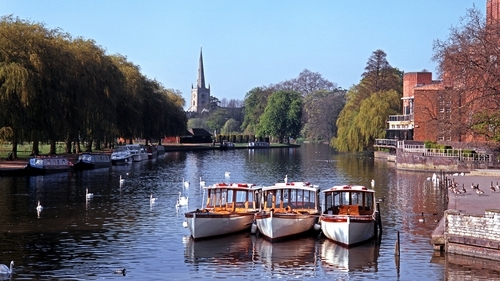 People in Stratford-upon-Avon voted in line with the national 52-48 decision to leave. Both Brexiteers and Remainers there are aghast at what they said was the national humiliation of Prime Minister Theresa May's collapsing exit negotiations. But under the gilded surface, both sides of the Brexit divide have ominous warnings for the politicians in London - dash our dreams and face a much deeper fissure that will bleed the UK for generations to come. For Molly Giles, a barrister in Stratford who campaigned to leave, Brexit is under attack. She warned that if it is thwarted the long-term stability of the country will be in peril too. "It would not be an open wound, it would be a deep internal wound that is slowly bleeding," Giles, a 36-year-old local Conservative Party councillor, told Reuters on the banks of the River Avon where swans glided beside rowers. "We would not be able to come together," she said. Figures in both camps lay claim to Shakespeare, a towering figure of pride who recast some of Europe's great love stories and tragedies and quarried the history of kings for some of the jewels of the English language. "This royal throne of kings, this scepter'd isle, This earth of majesty, this seat of Mars, This other Eden, demi-paradise... That England that was wont to conquer others hath made a shameful conquest of itself," nobleman John of Gaunt intones. The Bard may have died four centuries ago, but some argue Britain's modern-rulers have once more brought the nation low. May, who voted to stay in the EU, is a failed prime minister who has "mis-sold" a poor deal and so should make way for true Brexiteers, Giles said. The result of Brexit being foiled would not be a French-style yellow vest burning of the capital's boutiques, she added. Rather, the 17.4 million people who voted to leave would be cast into the political wilderness and many would be susceptible to demagogues in the future. "The problem then is: who steps into that vacuum? Who turns up to then appeal to these people to say 'I'm someone completely different' and actually not just completely different but somebody who says 'I'm going to trash the system and that is why you should vote for me.'" Cast either as an epic opportunity or grave mistake, Brexit has turned many of the assumptions about Britain upside down just as the world grapples with the rise of China and the West's deepest divisions since the 1991 fall of the Soviet Union. Opponents of Brexit say it will torpedo what remains of the United Kingdom's post-imperial clout, make its population poorer and strain to breaking point the sinews that bind England, Wales, Scotland and Northern Ireland together. Sophie Clausen, a writer and artist originally from Denmark, said the battle was personal. Recalling the rhetoric that had fostered her sense of mistrust in British politicians, she cited Prime Minister May's comments that those willing to move abroad were "citizens of nowhere" while EU workers in Britain had been able to "jump the queue". "I don't think this can be healed," Clausen said. "It will take a generation." Despite living in Britain since 1994, she was not allowed to vote in the referendum. Jonathan Baker, a retired head teacher, said he would continue to campaign for EU membership even if they lost a second referendum. "If it takes another 30 years to get back then so be it," he said. "We'll do what the Brexiteers have been doing. We won't give up." For some, Brexit was driven by anger at an elite in London who, they believed, neglected swathes of the country. For others it was a chance to reclaim sovereignty and control of its borders, free Britain from a sclerotic EU and build an economy more suited to a world racing into a technological revolution. Edward Fila, a 70-year-old former candidate for the anti-EU UK Independence Party, said that Westminster had let the country down, but said the division would only heal once Britain had followed through on the result of the referendum. "We have to have a conclusion to this, it has to be done," he said, sitting in front of the vast Royal Shakespeare Company theatre. "Regardless of what pain we all have to go through, there has to be an outcome," he added.